Main Material: TPU and Microfiber,Waterproof. PVC lining Size:L41*W16*H30 cm . Interior loops hold bottles in place. Small tote works great for heading out on quick trips or with older toddlers. Large tote diaper bag is great for day trips and longer travels. 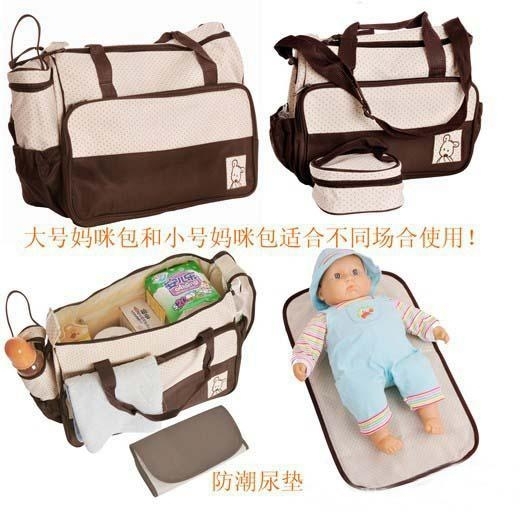 Diaper bag contains 1 Large bag 1 medium sized bag1 changing mat 1 feeding bottle holder1 Changing Mat Why buy this diaper bagMade with top of the range synthetic material to make the bag rain proof.Double-zippered top provides wide opening and easy access. The bag is user friendly with two outside bottle pouches, large envelope pocket, dirty duds bag, three inside storage compartments and clear outside pouch.Adjustable shoulder strap keeps bag from slipping. You'll love the abundance of travel and storage options with this set features a large diaper bag perfect for day trips and longer outings and a smaller tote for when you're just out for a short trip or traveling with an older toddler. The removable bottle holder keeps a bottle secure and handy, and the included changing pad in this highly useful diaper bag set. Order this amazing baby bag and have it delivered on your door step.